That group with the plasma balisong... there's a lot going on in there. Just a lot of different forms to the same items in there. A lot of different ideas for an assassin to use. 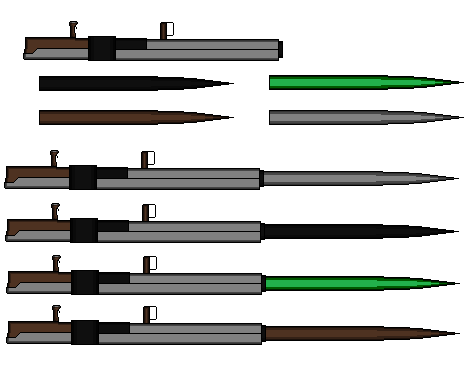 A Pile Bunker style weapon with pikes made of different materials for different creatures. Wood, silver, iron, and jade. An RBWY moment meets No More Heroes in terms of weapons. 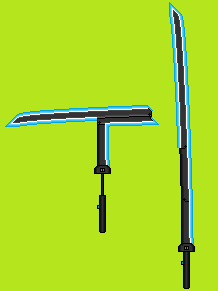 Yes, that is a hybrid-plasma katana that can become a sickle on a line. Uzi meets plasma sword. Not really much else to be said about it. 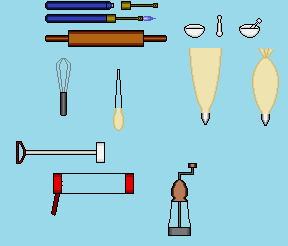 Some items for a baker, yep, that's a wooden rolling pin among that list. Those of you who may've played Wild ARM's 5 might recognize this weapon. And I will post more once I build up a good list. I don't exactly like posting one at a time. Thank you, and if you have any ideas for props/weapons to be made, let me know. I usually do this for fun, so I don't mind trying these here and there for other people. I always dig anything with an Uzi. The shotgun and folding sword are pretty cool as well. That one I felt like I did better with than a lot of my other weapons in terms of concept. Not sure why you'd laugh at that one. This is what I used for the reference on that one, the thin blade-design didn't exactly suit well for me and that handle needed more of a 'use', so I made it an iron-sight. Again, if any of you have any ideas to throw my way, I'm actually more than welcome to see if I can try them. I tend to specialize in props/weapons the most though, but characters and vehicles are a bit mentally tasking (albeit I have done a few if you review over the pics. It was a combination of how you made it. Was quite unique; It looks like a serious design with proper functionality, yet also very straight-forward and 'blunt' to a degree. With that I mean, it is what it was made for. That, and what you said: "Uzi meets plasma sword. Not really much else to be said about it." Maybe try a gauntlet with a mini missile rocket launcher or something. Maybe some form of mech with a flamethrower. 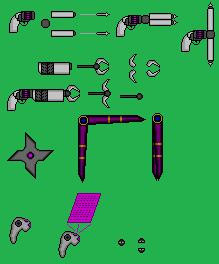 This is the approximate sizing for how the items are based, so the micro-rockets might be hard to see properly. The mech will be hard to properly make as that would fall along the lines of 'character' design. Fire away. I sometimes tennis-ball ideas back and forth, but if that happens, we may need to go to PM's (that includes you too, Shoon) or IM's for further discussion. And to drop a few more pictures, here we go. 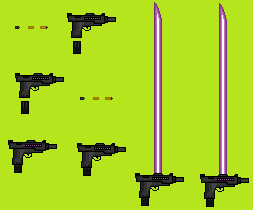 This idea was actually to be a weapon concept for a 'fusion' of two characters belonging to one friend of mine, using their main weapons in a way that would put them both together. I saw a sketch made by our very own Vokun here in the forums, so I requested that I attempt to make a sprite from it, this is the outcome of it. I had a moment of thinking how Batman was in terms of his gear, so I decided to try my hand at making some sprite versions of gear that had same functionalities (maybe less "bat" oriented) as what he had. Remember the revolver with the elemental shots? 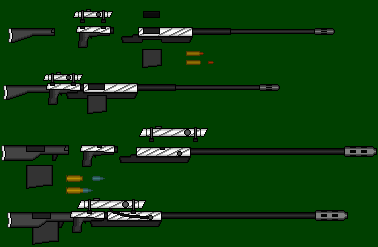 Well, here's a sniper rifle equivalent... though the design I kinda got inspiration from Mass Effect. This weapon was intended for a different friend of mine, which there will be another one for this friend right below. 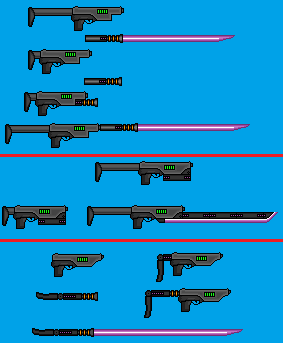 This time a pair of rifles, an anti-personnel and an anti-materiel type, for that friend I mentioned previously. Yes, the character is a sniper type, and yes, these can break down for easier carrying. I don't know why but I really, really like those rifles! Maybe I have some sniper in me? Well, I'm not sure how this idea might be do-able, but something like boomerang shurikens? 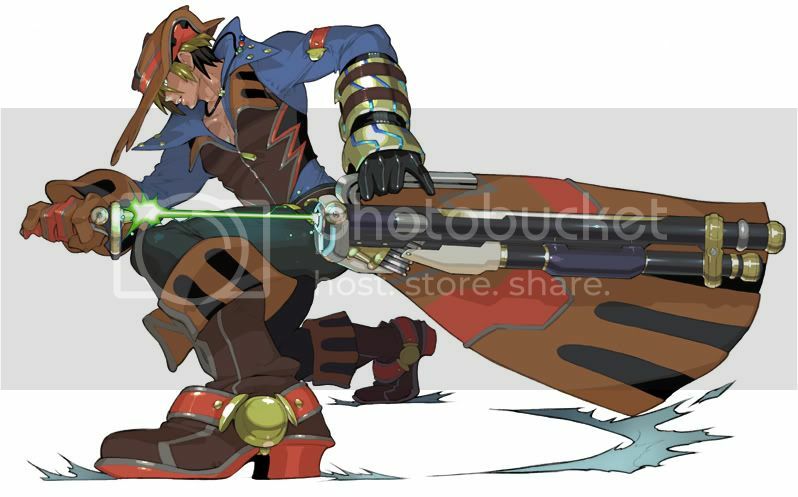 @ Shoon: For the arm-based rocket-launcher, I kinda do have something like that already made (see below). 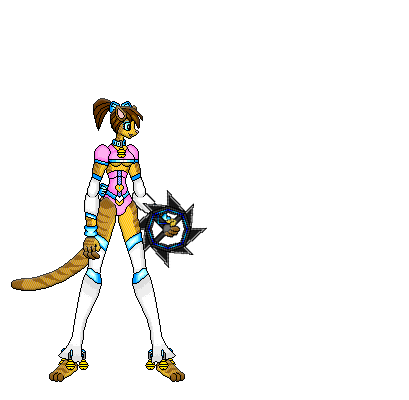 @ Ventus: The Jet Force Gemini shurikens actually have a homing capability AND will return to the thrower if they don't hit anything, but I think I could make a shuriken design to better show that... but the question is are you wanting it palm-sized, hand-span sized, or a discus-sized shuriken? I was thinking more along the lines of the star-shaped shurikens, which are able to fit in your hand (or palm). Something you could perhaps easily store to take with you. Does that make sense? Thats sort of what I had in mind.